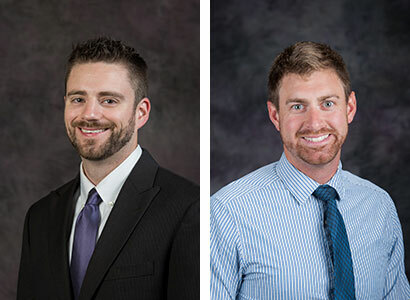 Stuart Heckman, assistant professor of personal financial planning, and Benjamin Strother, doctoral student, won the Northwestern Mutual Best Paper Award in insurance and risk management at the 2017 Academic Research Colloquium for Financial Planning and Related Disciplines Feb. 7-9. Their paper, "The financial impact and duration of disability across the lifespan," explores the effects of disability by measuring the likelihood of an initial disabling event across a person's working lifespan. Their research outlines populations most at risk of a disabling event and the ways that such an event can impact their future earnings. Heckman and Strother's paper was recognized as the best research paper in the area of insurance and risk management with implications for financial planning practice. Four K-State personal financial planning faculty — Kristy Archuleta, Heckman, Maury MacDonald and Martin Seay — and 11 doctoral students — Allen Ammerman, Christina Glenn, David Jayne, Mitzi Lauderdale, Vincent Le, Meghaan Lurtz, Katherine Mielitz, Julia Mull, Strother, Derek Tharp and Dennis Witherspoon — attended and presented papers and posters at the first Academic Research Colloquium in Washington, D.C. The colloquium was created for a variety of disciplines to present their financial planning relevant research. It is an outreach of the new Center for Financial Planning, established by the Certified Financial Planning Board as an academic home for financial planners. K-State's personal financial planning program is registered with the Certified Financial Planning Board, who then oversees the requirements for certified financial planning certification. Due to this registration, graduates of the program are eligible to take the certified financial planning exam. The personal financial planning program at K-State is in the College of Human Ecology. The program offers bachelor's, master's and doctoral levels of study. The personal financial planning faculty are not only passionate about financial planning, but are often expert financial voices in the national arena.